Injuries from these inflatables can range from bumps and bruises to contusions. 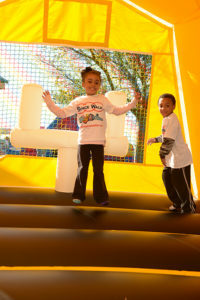 Be sure to have a bounce house safety professional set up the inflatable to ensure children’s safety while jumping. Having a professional set up the inflatable is a key element to preventing injuries and accidents. Collisions are a common occurrence when two or more bouncers collide with each other while jumping. Collisions are more likely to happen if children of varying sizes and ages are bouncing together in a kids’ bounce house, or if too many people are bouncing at one time. Older children will typically execute more strenuous movements (read: flips) than younger kids, which can result in injuries to the smaller youngsters. Older kids may not pay close enough attention to others around them while they jump, which may also lead to collisions. In addition, little ones do not always understand how to protect themselves in this environment by moving away from wild jumpers. Supervision is a key element of safety for jumping children. It’s also important to separate youngsters by age so different age groups take turns bouncing together. This will enable bigger and more energetic jumpers to use the equipment together, while little ones who do not move so wildly can use the kids’ bounce house separately from the big kids. Monitor the capacity of the inflatable as well. When the bounce house is filled with 4-6 year olds you can fit six jumpers perfectly. But if it is time for teenagers to jump, don’t allow more than three jumpers at a time. Make rules about children of different ages and sizes taking turns. Adults should maintain a constant presence while children use the equipment to ensure that youngsters follow rules. 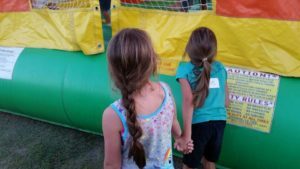 Now that you’re fully informed on the safety precautions for jumping in a bounce house, it is time to start your spring and summer events! Check out your local Space Walk’s inventory so you can start dreaming up the perfectly themed party.